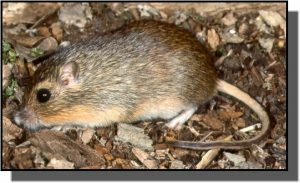 Comments: Hispid pocket mice have external cheek pouches for storing food and are the largest pocket mice in Kansas. They gather food at night and spend the day in shallow, underground burrows. Their bristly fur is brownish gray on top and white below with a broad yellow-orange band in between. Females produce at least two litters per year with 5-6 young per litter. They can live up to 3 years in the wild. Distribution: Hispid pocket mice range from central Mexico through the central United States. They are often found in the sand prairies of the western two-thirds of Kansas. Food: Hispid pocket mice feed on seeds, tender green plants and occasionally insects.